Though his discoveries helped to bring electricity into our homes, he continued to teach science by the light of a candle. Michael Faraday (1791 – 1867) was able to explain respiration, combustion or the composition of air, water and gases, and could get anyone attending his lectures to understand, using something as ordinary as a candle as an example. “Lighting one puts into play the laws governing the universe and is the best gateway to physics and chemistry,” said this autodidact who never went through college. He was a self-made scientist and ended up inspiring the greatest scientists of the next generations, as Maxwell and Einstein. Born into a very poor family, he had to start working early in life. He began as an apprentice bookbinder at a workshop in London and there, among the volumes of the Encyclopaedia Britannica of the early nineteenth century, Faraday discovered science. He spent his free time reading chemistry texts, taking notes, and going to conferences. Impressed by a series of talks given by Humphrey Davy, the young Faraday showed the Cornish chemist his well-bound book of notes from the talks, got himself hired, and once again became an apprentice, this time of chemistry. He soon surpassed his teacher, who was jealous and put the brakes on his career. When Davy died, Faraday took his place at the Royal Institution and, at the age of 40, was finally was able to devote himself to carrying out research that made history. He loved experimenting with magnets, and while thinking about the mysterious invisible force that attracted them and pushed them away from each other, he came up with a trick to view it. He placed a paper on a magnet and spread iron filings over it, which were ordered into lines and curves, and Faraday could see that where the magnet really had force was in those magnetic field lines. However, lacking the mastery of mathematics needed to put it all into formulas, he continued to experiment. The Danish physicist Oersted had noticed that a compass needle was deflected by bringing it close to a wire through which a current was passing, the same as was caused by the approach of a magnet, in other words, that electricity and magnetism had something to do with each other. Well, of course, thought Faraday, if an electric current created a magnet, the more winds there were in the wire, the stronger the magnet, and then a magnet might be able to generate electricity. He put a magnet near a coil of wire. Nothing. He put the magnet inside the coil. Again nothing. But he noticed that by moving the magnet, a current was detected in the wire. The effect occurred only when the wires of the coil cut the invisible lines of magnetic force. 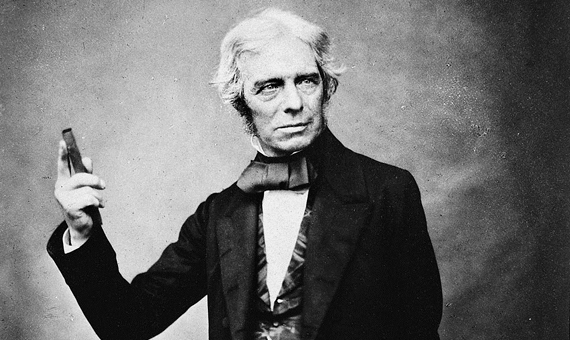 “What good is that?” that public asked in a talk in which Faraday demonstrated his discovery in 1831. “What good is a new-born baby?” he answered according to an urban legend that was also told by other scientists at the time. What he was able to achieve was to get that baby, the induction of electricity, to serve some useful purpose. He used it in a device that generated a direct current to set it in motion: he had thus succeeded in transforming movement into electricity, just like the dynamo of a bicycle. But thanks to the Industrial Revolution, animal traction was no longer needed. By coupling a steam engine to one of Faraday’s electric generators, one could get a lot more power –and more cheaply– than with a battery. With that innovation and with the transformer, another invention also based on his work, electricity became a useful energy and turned Faraday into a big celebrity. However, he rejected the honours offered him and kept on working and giving his popular Christmas lectures for youngsters. These talks caught the interest of people ranging from the husband of Queen Victoria to the writer Charles Dickens, who encouraged Faraday to collect them in the book The Chemical History of a Candle. 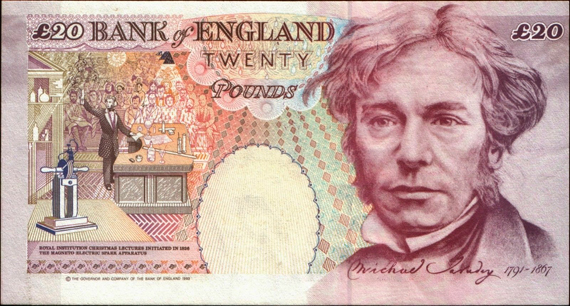 Even today, the Royal Institution maintains those traditional lectures, and for a decade Faraday appeared on the Bank of England’s 20-pound note, replacing Shakespeare in 1991, showing a candle to the public instead of being locked away in his laboratory.